Did you ever taste pots de creme? I have just discovered them and I am obsessed. They are rich, creamy and oh so delicious. 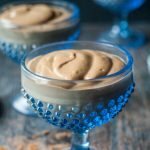 Recently I have been making them in my Instant Pot but when I tried to stretch the recipe it a bit and make it low carb, it became more of a mousse. 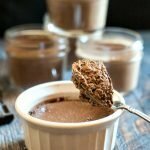 That is why I am calling this recipe a low carb chocolate mousse instead of a chocolate pot de creme. 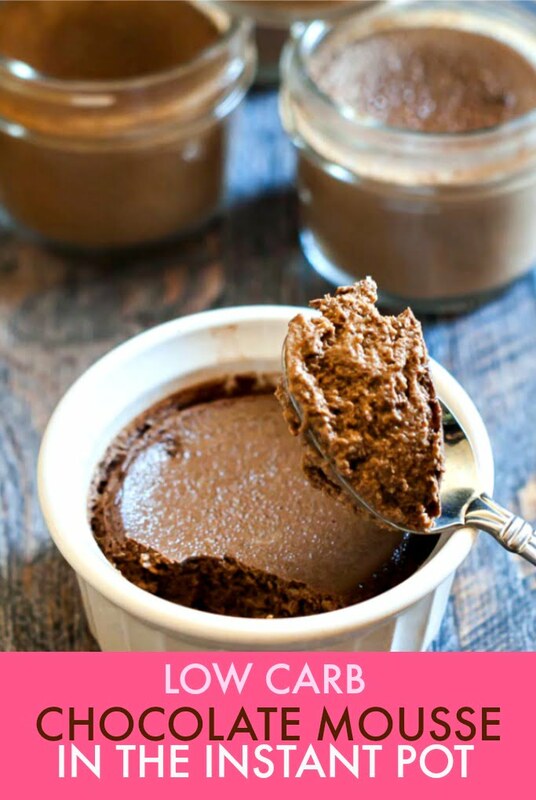 Regardless it’s delicious and low carb and with the Instant Pot it is very, very easy. Whether or not you are watching your carbs, you are going to love this recipe! At first I was nervous making them in the Instant Pot. I don’t know why but I was afraid they would explode. But luckily they didn’t and I got 5 servings out of this recipe with only 4.4g net carbs each. 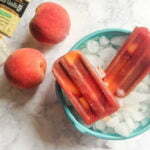 I used Swerve sweetener for this recipe but you can try Splenda or Truvia if you want. And if you don’t care about the carbs, just use white sugar. It will be rich and decadent, I promise you. Also I used 4oz mason jars I got from Target but only had 4 so I used these ramekins too. I like the jars better because they have a lid but the ramekins look better for guests. Let’s make some mousse. Add egg yolks to a bowl and whisk until they are well beaten. In a saucepan, add your sweetener and water and turn the burner on medium. 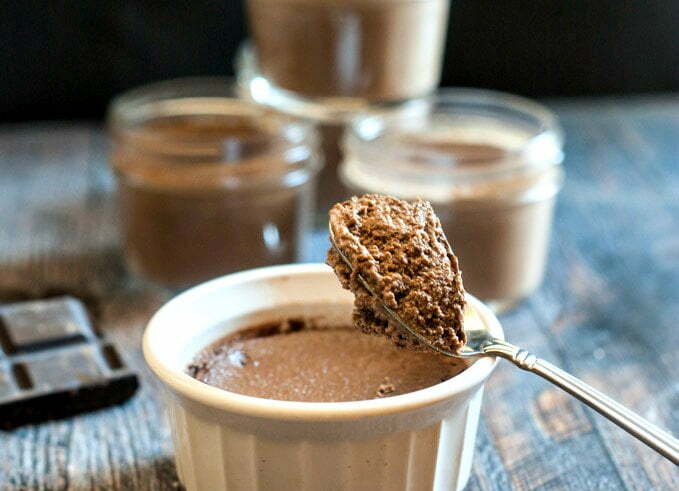 Whisk until the sugar is dissolved and then add in your cacao powder, cream and almond milk. Whisk again until well combined and heated through. Take it off the burner and then add in vanilla and salt. 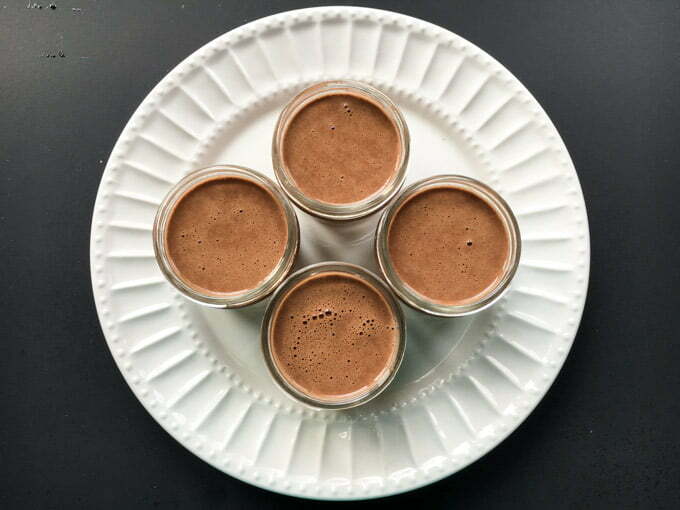 Now you want to add 1 tablespoon of the chocolate mixture to the eggs and whisk to combine. Then slowly pour the chocolate mixture in until everything is mixed well so you can pour into your jars or ramekins. Place the trivet in the Instant Pot (the one that came with it) along with 1 1/2 cups of water. Carefully put in your ramekins and lock the lid. Turn the venting nozzle to the back to create pressure. Hit the manual button for 6 minutes. When it’s done, quick release the nozzle and take off the lid. Let the ramekins cool on the counter for a bit before putting them in the refrigerator. 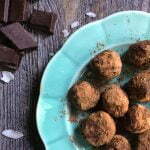 More delicious low carb treats! Dumb question but…Would powdered monkfruit sweetener work in the same amount as the swerve? 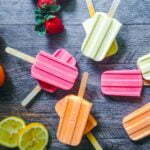 I’ve been on keto for a while but just recently decided to venture into fat bombs, desserts, low carb breads and other baked goods as my menu options were getting a bit too repetitive. Every recipe calls for a different kind of sweetener and I only have the monkfruit, Golden, classic and powdered. Thanks! This looks so yummy! Can’t wait to try it. There is definitely a science to baking with sweeteners and to be honest I am not the best baker. However I looked it up and it seems that pure monkfruit is a bit like stevia which is much more sweeter than sugar. I know Swerve which is erythritol is 1 to 1 with sugar. So I would look at your monkfruit package and see if it is pure monk fruit or a blend of monk fruit and erythritol. It should say on the package how much would equal to a cup of sugar. Does that make sense? So for this recipe the amount of Swerve is the same amount I would use if I was using pure sugar. If your package has information as to how it compares to regular sugar you should be able to figure out how much to use for this recipe. Hope that helps. Thanks so much for the response. The powdered monkfruit is a 2:1 ratio to sugar. If the swerve is 1:1 to sugar then I need to halve the amount of sweetener. I’m hoping that won’t mess with the texture. Making this tonight so we will see. Hi Cat, it might. This is a finicky recipe but I hope it works out. However you did inspire me to buy some monk fruit though. I bought the regular, golden and even some maple syrup so we’ll see what I can do with it. Let me know if you have any other questions about the mousse. What size of ramekins/jar they wete in? Hi Zee, I believe the jars were 2.5 inches in diameter and the ramekins were 3 inches in diameter. Hope that helps! I’m new to Instant Pot cooking. Does it matter what size your IP is? I know the 6qt is the standard, but we have the 8qt. 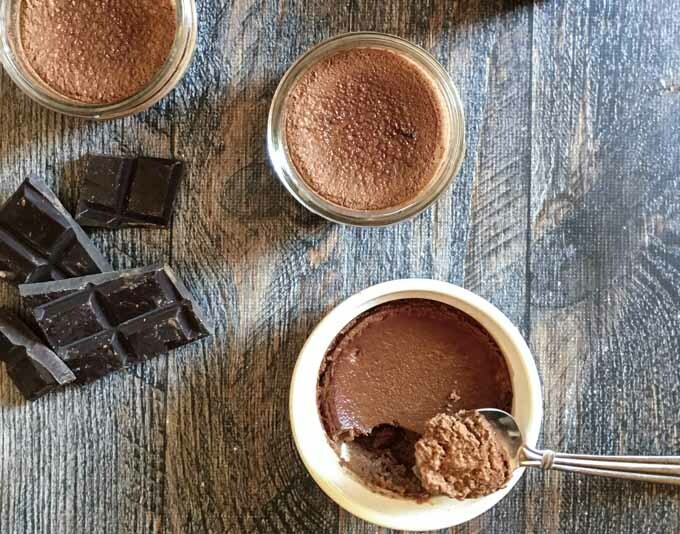 Chocolate mousse might be my favorite dessert ever, so I’m hoping I can get these to turn out! I don’t think it matters on what size but to be honest I’m not sure. I just can’t see why it would matter as long as you can put the ramekins in easily. 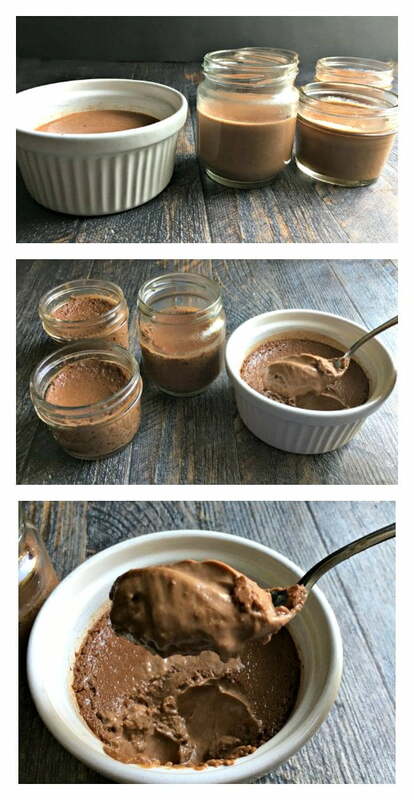 It’s a bit tricky to make mousse but I made this so many times last summer and had pretty good results so if you have any questions, just ask. Check out the comments too for some tips from other readers. 🙈 What is an instant pot? Is that like a pressure cooker? Oh my goodness…. I did not have that problem but I can see where that would happen. that might be a good idea. Thank you for pointing that out! I was able to get most of the water off and salvage them. It was DELICIOUS!! Wonderful recipe! I just tried this recipe for the first time and it was a mess. Watery chocolate pots is what I got. I’m sad I wasted all that cream and eggs on this batch. I will however try one more time with foil cover on each ramekin to see if that helps. Fingers crossed because they smell so delicious. Oh wow, so sorry Sandra. It is a bit runny at first but when you refrigerate they should set up. If however it’s the condensed water on the lid or something that could make them watery and the foil should help. I hope they work out for you!!! Should they be runny when removed from instant pot? Hi Kelly they should not be runny. If you let them sit a bit they might firm up but they shouldn’t be runny. Here are some pictures from the last time I made them…. the first is what they looked like before they went in the instant pot and the 3 kinds of containers. The second and third are when they were done. I kind of rushed through these. Hope that helps. Which Swerve Sweetener did you use? Granular or Confectioners? Thanks! Hi Kristin, I used the confectioners. I don’t think it matters much though. Facts… 32 gm carb, 28 gm fiber??? The high carbs and fiber and due to the use of Swerve Sweetener. It’s high in carbs and fiber but the net carbs is 0. 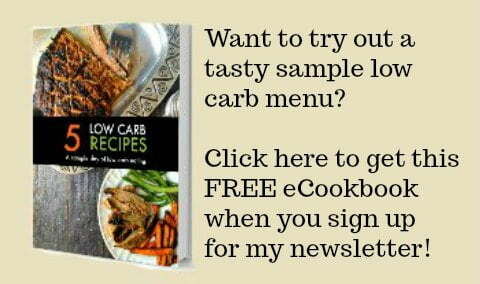 Many people use it in low carb cooking. Hope that makes sense! Those nutrition fats don’t seem to make sense to me though…35 gm carb, 28 gm fiber?